Palliative care is an essential element of any health care system and a component of comprehensive and integrated care. Access to good palliative care is a basic human right. Palliative care has evolved since its modern foundation: the British Hospice model proposed building comprehensive models of care (responding to all dimensions of needs of patients). Palliative care has since spread into all the different settings of the health care systems. The shift from the institutional and late care of terminal cancer patients toward the timely community- and population-based perspective and links to chronic care models. Initiatives of compassionate communities which aim at involving society to change attitudes toward end of life and propose integrated care at the community level. European Association for Palliative Care. Standards and norms for hospice and palliative care in Europe: the EAPC White Paper. 2009. http://www.eapcnet.eu/LinkClick.aspx?fileticket=f63pXXzVNEY%3D&tabid=735. Accessed Jul 2018. World Health Assembly. Resolution WHA67.19: strengthening of palliative care as a component of comprehensive care throughout the life course. 2014. http://apps.who.int/medicinedocs/documents/s21454en/s21454en.pdf. Accessed Jul 2018. World Health Organization. Palliative care. Fact sheet no. 402. 2015a. http://www.who.int/mediacentre/factsheets/fs402/en/. Accessed Jul 2018. World Health Organization. Planning and implementing palliative care services: a guide for programme managers. Geneva: World Health Organization; 2016. 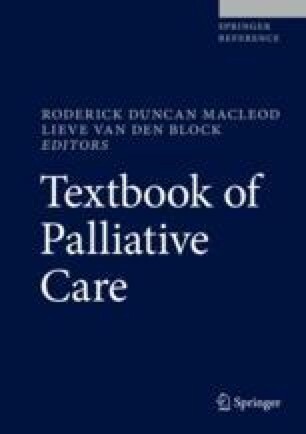 ISBN 978 92 4 156541 7. http://www.who.int/ncds/management/palliative-care/palliative_care_services/en/. Accessed Jul 2018.